LONDONBritish Prime Minister David Cameron lost a vote endorsing military action against Syria by 13 votes Thursday, a stunning defeat that will almost guarantee that Britain plays no direct role in any U.S. attack on Bashar Assad's government. A grim-faced Cameron conceded after the vote that "the British Parliament, reflecting the views of the British people, does not want to see British military action." Where's the evidence Assad used chemical weapons? The prime minister said that while he still believed in a "tough response" to the alleged use of chemical weapons by Assad's regime, he would respect the will of Parliament. In response to the vote, the White House said it would continue to consult with the British government. "As we've said, President Obama's decision-making will be guided by what is in the best interests of the United States," Caitlin Hayden, a spokeswoman for the White House and National Security Council said in a statement. A Senior administration official told CBS News' Major Garrett late Thursday that the White House plans to release its Syria intelligence report on Friday. The vote's defeat in British Parliament was as dramatic as it was unexpected. 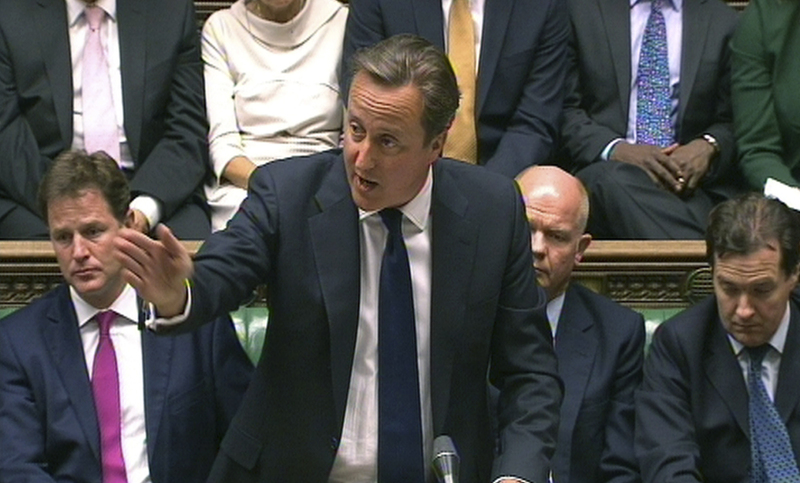 At the start of the week, Cameron had seemed poised to join Washington in possible military action against Assad. The suspected chemical weapons attacks took place Aug. 21 in suburbs east and west of Damascus. The humanitarian group Doctors Without Borders has said the strikes killed 355 people. Gruesome images of sickened men, women and children writhing on the floor drew outrage from across the world, and Cameron recalled Parliament from its summer break for an emergency vote, which was widely seen as a prelude to international action. "The video footage illustrates some of the most sickening human suffering imaginable," Cameron told lawmakers before the vote, arguing that the most dangerous thing to do was to "stand back and do nothing." But the push for strikes against the Syrian regime began to lose momentum as questions were raised about the intelligence underpinning the move. During a debate with lawmakers, he conceded that there was still a sliver of uncertainty about whether Assad truly was behind the attacks. "In the end there is no 100 percent certainty about who is responsible," Cameron said, although he insisted that officials were still as "as certain as possible" that Assad's forces were responsible. That was not enough for Britain's Labour Party, which is still smarting from its ill-fated decision to champion the invasion of Iraq in 2003. The party announced its opposition to the move despite Cameron's concessions, which included a promise to give U.N. inspectors time to report back to the Security Council and to do his outmost to secure a resolution there. He also promised to give lawmakers a second vote in a bid to assuage fears that Britain was being rushed into an attack. In the end, it wasn't enough to dispel lingering suspicions that what was billed as a limited campaign would turn into an Iraq-style quagmire, and Cameron lost the late-night vote 285-272.